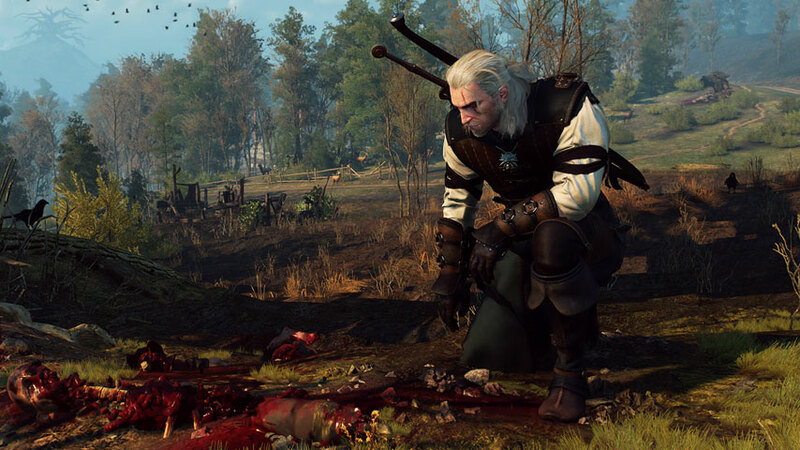 The Witcher 3 now has you Hunting A Witch, even though you’re not one of the Witch Hunters. Delightful. Follow your HorsePS to Midcopse. Everyone here seems to be talking about the witch, and there are several ways to get the information you need. Here’s the most direct way: approach the woman indicated by the waypoint sweeping outside her house, close to the armourer. She’ll send you to talk to her hubby. If you upgraded Axii, you can extract the information you need from him; otherwise you’ll have to bribe him. However you get your info (or even if you don’t), here’s how to reach the Witch: exit town and walk around the borders of the large pond until you reach a standing stone by the road. Take the right fork up a little rise and through the trees until you pass a cart, which indicates you’re going the right way. Keep on a little further and you’ll see the witch’s hut. Inside the hut you can take a look around; be sure to open the trapdoor and loot the cellar for several keen items including manuscript pages. When you’re ready to go, touch the skull on the cabinet to open a portal when you’re ready. Just walk into it to be teleported. Approach the tower and climb the stairs to have a chat with the witch. This successfully completes Hunting A Witch and begins Wandering in the Dark. Onwards to Wandering in the Dark, or back to The Witcher 3: Act One – Velen.